Materials Hoop Pine plywood, polished timber base. This sculpture lightly floats on a heaving wave. This timber vessel is simple in form, reminiscent of Inuit carvings. 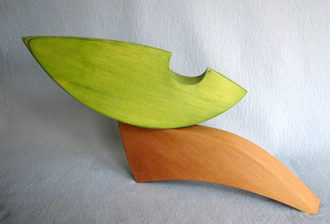 The kayak can be arranged in several directions and angles on the base, so you can change the form of the sculpture. The base has a wax finish.